Last month I wrote about how Twitter is going mainstream in the UK and featured some newspaper clippings showing how Twitter was being widely covered in the UK national press. I also wrote about the proliferation of Twitter use by UK celebrities and predicted that this would also add to the volume of UK Twitter use. 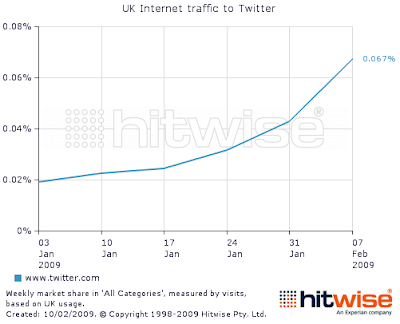 In January Hitwise detailed that UK Twitter use had grown by 974% from Jan 08 to Jan 09 (not including Twitter use through apps like Tweetdeck and Twhirl), but in their latest post Hitwise have gone on to reveal that UK Twitter use in the first month of 2009 has trebled! Initially UK growth was put down to the 'Stephen Fry effect' (where Stephen Fry is 2nd most followed Twitter user globally after Barack Obama), but other UK celebrities have now entered the top 100 global Twitter users according to Twitterholic - with Phillip Schofield, Chris Moyles and Russell Brand entering the top 100 global most followed users in less than a month!